Literary, romantic Caspian entered the US Top 1000 in 2017. Our Baby Name of the Day could be the next big thing. Located between Russia and Iran, the Caspian is an inland sea, or maybe the world’s largest lake. You’ve probably never heard of the major cities surrounding it: Sumqayit, Azerbaijan, anyone? Babolsar, Iran? Only the most intrepid of travelers has visited the region. Once part of the Paratethys – an ocean that predates the current alignment of our continents – it makes for some curiosities. There’s a species of seal found only in this sea, and Sabayil Castle, submerged for five centuries following an earthquake in 1306, until the water receded. Beluga sturgeon swim in its waters, the source of the world’s priciest caviar. The name comes from an ancient tribe living on the neighboring shores. The Greek historian Herodotus mentioned them by name in the fifth century BC. Some sources suggest it means white, but that’s far from certain. The Iranian city of Qazvin may come from the same root. The place name took on a different kind of meaning when C.S. Lewis borrowed it for a character in his series, The Chronicles of Narnia. Published in 1951, it tells of the further adventures of the Pevensie children. Peter, Susan, Edmund, and Lucy must return to Narnia to help Caspian save his throne from his evil uncle Miraz. Lewis chose other names from the atlas, including Narnia. It came from Narni, an Italian city. As for the prince, he’s handsome and noble. The rightful heir to the throne, he wages war against his corrupt uncle, with the help of the Pevensies. He becomes King Caspian X. The new king’s adventure continue in three more books in the series. As names go, this one is quite new. 1998 marks the first year enough children received the name for it to register in the US Social Security Administration data, with nine boys born. That might be down to a character in Highlander: The Series, a 1990s Canadian-French fantasy adventure series, inspired by a 1986 movie. By 2008, that number reached just 33 – still very small. That’s the year Ben Barnes played the prince in the Chronicles of Narnia movie based on the book Prince Caspian. It might have been enough to push the name into wider use. Barnes reprised the role in 2010’s The Voyage of the Dawn Treader, but by 2011, there were still just 39 boys given the name. Instead, Caspian might owe its rise to a celebrity baby. In 2012, Neve Campbell gave the name to her son. By 2013, there were 84 newborn boys with the name; and by 2017, 248, enough to tip it into the Top 1000. There’s also Jessica Verday’s bestselling young adult series The Hollow. It re-tells the Sleepy Hollow story, and gives us a mysterious character by the name. Child actor Caspian Diament has made an appearance on This is Us. It’s a place name, just like Camden or London. It picks up on the three-syllable, ends in -ian sound of favorites Julian and Sebastian, as well as other rising names, like Gideon. More elaborate boy names have fared well in general, with choices like Gabriel and Santiago sharing the Top 100 with Luke and Jack. While this name is attracting more attention, it remains just under the radar, a great fits-in/stands-out choice for a son. What do you think of Caspian? Can you imagine it catching on? 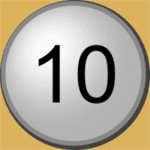 First published on May 16, 2008, this post was revised substantially revised and republished on May 13, 2013, and again on October 3, 2018. Our 3rd son born June 2013 is Lennox Caspian, my husband was reluctant at first but we’ve read that Caspian means from the sea and a few afters after he was born we found out it was World Ocean’s Day! We love this name so much that we often refer to him as Caspian or Prince Caspian. I am really loving this name lately and am seriously considering it. Do you guys think it would go well with my son Maximus’ name? I think so. Just gotta convince hubby. He didn’t jump for joy when I mentioned it but he also didn’t reject it Haha! Narnia was the original Roman name of Narni – C.S. Lewis must have been aware of this as a scholar. 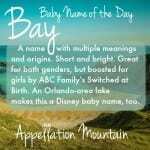 I love this name – it has such an ancient and mysterious history, and I learned a lot reading this post. But this line made me cringe: “it is the fourth in the series chronologically.” don’t give in to the nouveau order, AppMtn! It’s a travesty. Saranel, it took me a while – but here it is! 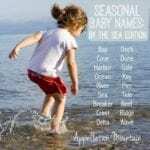 I called my son Caspian (born March ’10). I loved it ever since I was 7 or 8 and read Narnia, although my husband was reluctant at first. We both love it now, and always get comments on what an unusual and lovely name it is. I like that the instant association is ‘Prince Caspian’, rather than, as you say, wherefore art thou Romeo. And imagine if your darling daughter brought home her prom date … Romeo! Of course, since it was the 505th most popular name in ’07, it could happen. I can’t promise to keep a straight face should that ever come to pass. I’ll take Caspian over Romeo any day. Romeo is still a bit dramatic for me. 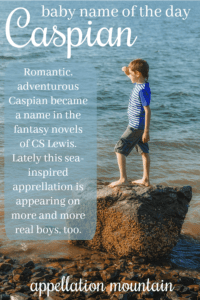 Caspian is dreamy, romantic, and a place name without dooming that child to “Where for art thou, oh Romeo? […] list of birth announcements at Nameberry was just so much fun.